Unique drive system | What Car? There will be a 'unique feature' being kept under wraps for the moment to help owners get the best real-world economy. The story of how it all works is revealed by the name of the drive system: Integrated Motor Assist. The Insight will have extremely limited capabilities on electric power alone and won't even pull away from standstill without the help of the petrol engine. However, the electric motor allows a smaller-than-average petrol unit to be employed without compromising performance or driveability. The motor's batteries are recharged under deceleration and braking. In the Insight, the batteries and the electronic control unit that manages the whole power system are mounted beneath the boot floor, minimising intrusion into passenger space and keeping the car's centre of gravity low to improve handling. 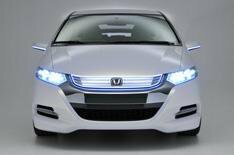 The car is based on an all-new platform unrelated to any other Honda and is styled to reflect the look of the FCX Clarity, Honda's hydrogen fuel-cell car available for lease in California.